There has been a scary trend in one UK community of late - drug dealers specifically targeting children for the sale of the prescription drug Valium. The story resonates because teens are extremely vulnerable to prescription drug abuse - studies have shown that they believe prescription medicines are a safe way to get high. As a BBC story shows though, that is obviously not the case. But this perception is one of the reasons a variety of prescription drug tests are for sale - a Valium Test or an OxyContin Test to name two are available at Home Health Testing. In this Wales community, Valium dealers have been selling to school children in their teens. As described by a detective on the case, "After taking these tablets the young people cannot remember where they have been or what they have done from one day to the next." Some have been taken to the hospital. In the US, prescription drug deaths are astonishingly high - the leading cause (per CNN) of drug overdoses is prescription drugs. If you wish to know if someone is on drugs, a Xanax Drug Test and as said above, an OxyContin Test are available. These tests can help you start a conversation about what is a dangerous habit. The Partnership Attitude Tracking Study found only 24% of teens discussed prescription drug abuse with their parents and 41% of teens believe abuse of medicines is less dangerous than the abuse of street drugs. This is disproven by the documentary "The OxyContin Express," covered in an older article here. Although discussing and dealing with drug abuse may not be easy, there are many resources on the Internet to help. TheAntiDrug.Com has some great resources. 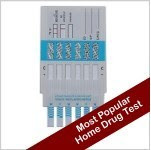 You can also, if you choose, purchase a home drug test from Home Health Testing or visit the directory of prescription drugs on the Home Health Testing site to find which products test for which drugs.